MARCH 18, 2010: In 2007 I was one of the first 10,000 people in the United States to start taking the latest FDA Approved Multiple Sclerosis Drug, Tysabri. For 2.5 years, I’d go to Scripps Clinic in San Diego, CA for a monthly IV infusion. But, a new drug means no long term studies or known long term side effects. I was so nervous for my first infusion, I asked my “emergency contact” to sit with me at my appointment. I felt like I was signing my life away– and I nearly was. I had to sign a daunting stack of paperwork indicating I knew the risks. They tracked my blood count, liver function, body temperature… all the things. This meant, every infusion appointment lasted 3 hours. Since I always turn a setback into a stepping stone, I used the time to “treat” myself. First, I’d schedule my appointment at the end of the day so I could leave work early, for what I’d call, a “date with two of my favorite ladies, Nurse Debbie & Oprah!” Sitting with an IV in your vein, in a room lined with reclining chairs, isn’t so bad when paired with a favorite talk show host and talk time with a favorite RN! Debbie was my infusion nurse every single time. We developed more of a Mother and Daughter role than Patient and Nurse. I even bought her a 90 minute massage on Christmas as a thank you for not only finding my vein without a bruise but for caring so much. But everything changed the day she had to tell me the devastating news. A handful of Tysabri patients contracted an incurable brain disease, Progressive Multifocal Leukoencephalopathy (PML). However, WHY these people were dying was a mystery other than the fact they’d been receiving Tysabri for 2.5 years… the same amount of time as me. In response, I’d now need to be monitored more closely. Additional MRIs and visits with my neurologist. To say this was unsettling is an understatement. My interpretation: instead of treating MS, I was now treating a medication. This didn’t settle well. Having been on COBRA the year prior (I lost my job in 2009 when the market crashed), I began researching alternative medications, was synchronistically guided to a variety of healing modalities and read a handful of “energy” books that “spoke to me”. My veil was lifting. The more aware I became of my thoughts and choices, the more empowered I felt. I also thought, “if I think Tysabri is poisoning, I might be contributing to the poison!” I began to question everything. I hadn’t had an “MS exacerbation” with full blown symptoms since 2004. The longer I sat with my story, my intuitive nudge to let go of medication increased. Ignoring my internal feelings began to feel more irresponsible than to continue taking the drug. And then came… the icing on the cake: my health insurance changed. Having accepted a new recruiting job with a smaller company, it was time to let go of COBRA and begin my new plan. My previous large public company provided an insurance that covered outpatient infusions without a copay. To cover my bases, I called the clinic prior to my next appointment to make sure there were no surprises. Talk about a sticker shock! Thank goodness I asked. What was the Co Pay of my first Infusion on my new plan? $3000 out of pocket. Those words sealed the deal, like a nail in the coffin. I was done. Immediately, I called my neurologist to learn if I ran the risk of setting myself up for an MS relapse if I stopped taking my medication. “Nope, it takes 3 months to leave your system.” Ok. good. Next, I called my parents to tell them my decision. Since this involved my heath, as concerned parents they offered to help pay for my treatment. I politely declined. This wasn’t about the money (though I could think of a zillion other ways I’d like to spend 3K! )… this was about “my knowing”. The chapter of taking medication had come to an end. And, my parents had a reason to trust my decision. 2 months prior, January 2010, I completed my 1st Half Marathon. At first, they were concerned I’d overheat and experience a relapse. Instead I experienced the exact opposite. With a finish time of 2:02:54, not only did I run without any hiccups, but I ran strong, and fast, boosting my confidence in ways I never imagined. I felt reborn, like I could conquer anything. Training for my half marathon became my “medicine”. Running made me happy. And happy felt healthy. So… On March 18, 2010, the day I had my last infusion scheduled with Nurse Debbie, I called the clinic and cancel it, without a reschedule. Ultimately, this made 3/18/10 the day I “stopped taking MS Meds”. IF (because there’s always an “if”) I became symptomatic or regretted my decision, I’d go back on medication. Fast forward to today, 9 years later. Not only do I stand by my decision, but any neurologist does too. In fact, you couldn’t pay a single MS Doctor to suggest I go back on Tysabri. Why? Scientist discovered the reason people contracted PML. There’s a common virus many people carry, the JC Virus. Typically, it’s harmless. But, when combined with a suppressed immune system, it can be deadly. Guess who has a large amount of the JC Virus in her system? You guessed it, ME. You and I will never know the “What If. What if I had continued on Tysabri? What if I ignored my intuition? I fully believe my inner compass knew best. I feel I was guided to live a life, MS medication free.But PLEASE NOTE: I am not ANTI MS MEDICATION. Instead, I AM in support of listening to what works for my body and encourage anyone out there to listen to their body too. It’s OK to question. It’s OK to be curious. We are living science experiments; what works for one doesn’t always work for another. I feel in control with a disease that leaves many feeling out of control. I’m beyond grateful to share I have not experienced a debilitating symptom or questioned my decision, since. 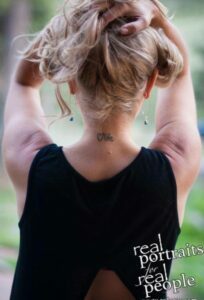 My Reply, “The happier I got, the healthier I got!” Then I lift my hair and proudly show them my tattoo. WHY? I believe the neck is the most important part of the human body. WHY? Simple: As long as I’m alive and loving life, I’ll have one! Personally I don’t know anyone living without one. My rationale: Let’s say I got a tattoo on my arm or leg. Reality is, there’s always the chance I could lose it! BUT- as long as I’m alive, I’ll have my neck! Plus, I love wearing my hair in braids and pony tails, especially when I’m loving life, running, biking, yoga, hiking, making out, you name it! Move it or Lose It! If I’m doing something I love, I’m loving life. Aside from housing major blood vessels and multiple nerves, the the neck is the top part of the Spinal Cord, better known as The Brainstem, the intersection where ALL nerve messages pass in the body. In addition to nerves coming from and within the spine, the neck is home to the accessory and vagus nerve. So much life happens inside our neck! Since Multiple Sclerosis effects the nervous system, people like me are very aware of how it all “works”. Except the times the nerves, don’t work. For example, in 2004, I went to go to work. Instead of starting my day like usual, a lesion in the base of my brain stem, top of my spinal chord, decided to make itself known and unknowingly to me, while I slept my nerves were compromised and the message to my left leg, severed. Not only could I not get out of bed or drive my car (I had a 5 speed with a clutch) but I couldn’t even tell my toes to wiggle. My left leg was paralyzed. Are you aware of the studies by Dr. Masaru Emoto? He’s known for his theory that water could react to positive thoughts and words. Which leads to the questions, ‘if the human body is 70% water, imagine what our thoughts do to our bodies?’ In 2005, watching the movie “What The Bleep” I discovered the power of “blessing water”. For years I day dreamed of a tattoo to bless my body. What would I get? Where would I put it? Then, it dawned on me. I wanted to bless every message passing through neck, also where my lesion was, to keep my body in motion. I chose “Love Life” because, it’s who I choose to be in the world, loving life. Plus, the idea of a tattoo on my neck felt like a bumper sticker, in case anyone behind me needed a friendly reminder. Since my Mom is an artist, I asked if she’d help me come up with a design for my tattoo. 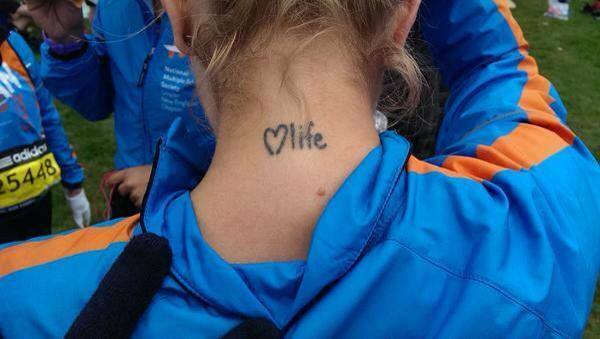 She smiled at the idea of designing a tattoo for her daughter and happily “doodled” some “love life” ideas on a piece of paper. As if meant to be, March 18, 2012 was the date of the Half Marathon in my new town, Wilmington, NC. That marked my 2-year anniversary of being MS Med Free! It was the perfect way to celebrate. After completing the 13.1 miles, I knew exactly how I wanted to honor my journey. Grabbing the piece of paper with my Mom’s doodles and a best friend for support, we headed to the local tattoo shop. Upon sharing my idea with the artist, he quickly pulled up his pant leg to show off a tattoo of his Grandmother’s signature! Turns out he was a huge fan of family penmanship and loved the idea of tracing my Mom’s handwriting from the doodle… to my actual tattoo. 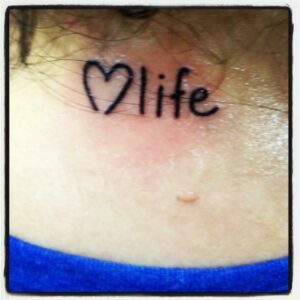 Just like that, he copied it to transfer paper and gave “♥ Life” even more meaning. The woman who literally – gave me life – was forever part of my tattoo, too. Talk about a triple whammy! MARCH 18, 2019: 9 years later, I’m proud to be free from MS medication. I’m proud to have run 18 Half Marathons and 3 Marathons, including both The Boston and New York City Marathon, in 2015. I’m proud I turned a stumbling block into a stepping stone. I’m proud of all the love and support I’ve received from family and friends. And I’m most proud of still feeling giddy anytime someone tells me they love my tattoo. ” ♥ Life” is a personal birthmark I gifted myself. It will never lose its luster or value. 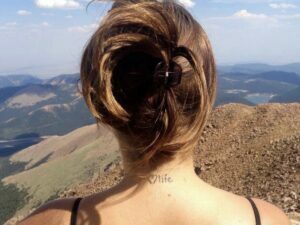 When I’m 88 years old, I’ll still have my Mom’s handwriting on the part of my body I’ll still consider to be the mecca of our messages and it will still represent my favorite sport, running and my favorite but simple Mantra, Love Life. Just like you, I’m human. Just like you, I have bad days. I DO NOT CLAIM to have “Cured” my MS. MS is still in me. I can see it in lesions. I can feel it on days my left side feels slightly weak. But, I’m always reminded when I pull out a mirror to look at the back of my neck, what matters most. My ability to choose. The choice is mental, physical, emotional and spiritual. It’s not always easy but long as I have a neck, I can breathe on my own and I have control of what feels out of control… I have the choice to” ♥ Life” in whatever capacity that means in the moment. So now I ask you, what thoughts or questions come to mind? Are you on a healing journey? Are you considering treatment options? What new awareness can you have to help you begin a journey of self care and love? Want support on your Healing Journey? You are not alone! Sometimes the best gift you can give yourself is time with someone who understands you and can really help you navigate the choices you face every day to get you in the direction of your dreams. CLICK HERE TO SCHEDULE a One on One Session Via Phone/Zoom or In- Person in the Denver/Boulder Area. Is this our first time connecting?? Then… schedule A Complimentary 15 Min Connection Session so we can meet! READY TO CREATE REAL CONNECTION? Join My Newsletters & Let’s Connect! Plus, when you enter your email you’ll receive a download of 5 Ways To Turn Strangers Into Friends! Download "Carlyn's 5 Way To Turn Strangers Into Friends!"